Women who were exposed to colder temperatures during pregnancy had a lower rate of gestational diabetes than those exposed to hotter temperatures, according to a study published online today in the Canadian Medical Association Journal. Dr. Gillian Booth, a researcher at St. Michael’s and the Institute for Clinical Evaluative Sciences (ICES) and lead author of the study, said the finding might seem counterintuitive, but can be explained by emerging science about how humans make different kinds of fat. “Many would think that in warmer temperatures, women are outside and more active, which would help limit the weight gain in pregnancy that predisposes a woman to gestational diabetes,” said Dr. Booth. A similar effect was seen for each 10-degree Celsius rise in the temperature difference between two consecutive pregnancies compared within the same woman. In addition to a higher rate of gestational diabetes among women who were exposed to hotter temperatures during pregnancy, there was also a lower rate of gestational diabetes among Canadian women born in cooler climates versus those who were born in hot climates. Those women born in cooler climates, including Canada and the United States, and who were exposed to cold temperatures during the 30-day period prior to screening had a gestational diabetes rate of 3.6 per cent, while those exposed to hot temperatures had a rate of gestational diabetes of 6.3 per cent. In comparison, women who were born in hot climates, including South Asia, Africa and the Middle East, had rates of gestational diabetes of 7.7 and 11.8 per cent, respectively. According to Drs. Booth and Ray, the findings, combined with the continued rise in global temperatures, could signal an increase in the future number of gestational diabetes cases worldwide. “While changes in temperature of this magnitude may lead to a small relative increase in the risk of gestational diabetes, the absolute number of women impacted in Canada and elsewhere may be substantial,” they wrote. 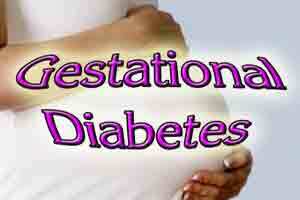 Gestational diabetes is new onset diabetes in the second trimester of pregnancy and is usually temporary, but the risk factors for gestational diabetes and adult onset type 2 diabetes are virtually the same. The results of this study could foreshadow the effects of rising world-wide temperatures on type 2 diabetes in general, according to the researchers. “This is like the canary in the coal mine for the possible effects of global warming on adult onset diabetes,” said Drs. Booth and Ray. This study was funded by the St. Michael’s Hospital Foundation and the Canadian Institutes of Health Research (CIHR).